SAL DeTRAGLIA'S VIRTUAL TAPAS BAR: SPAIN IS CLOSED...COME BACK IN SEPTEMBER. It’s true. Each year when the clock strikes 2pm on the last Friday of July, Spain’s main cities transform from bustling urban bazaars to something resembling NASA footage of the lunar surface. Stores and restaurants are shuttered. Streets are devoid of traffic. Prime parking spaces abound. If Spain had tumbleweed, it would be tumbling. 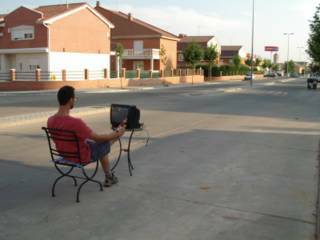 August is the month that most Spaniards take vacation. This, in itself, is ironic. Spain is not exactly known for its orderliness. The Spanish perception of orderliness would strike most Anglos and Germanics as a half-step from anarchy. Queuing in the British sense – i.e., patiently waiting in a single file line…and actually enjoying it – does not exist here. Rather, Spanish queuing is more of a “gather `round and sniff your neighbour’s cologne” affair. Driving and parking are even worse, with most Spaniards viewing no parking zones as more of a suggestion than a mandate. So imagine the absurdity that a country living in controlled chaos for eleven-twelfths of the year will – on the same afternoon – uniformly pack up and leave. But that’s what happens. And many Spaniards do, in fact, take off the entire month of August. This is shocking (at best) or heretical (at worst) to Americans; a work-loving people who may get only two weeks of vacation each year, yet are afraid to take it all at once. In Spain, however, nary an eyebrow is raised at the prospect of thirty-one uninterrupted days of lounging about. So…where do these Spaniards go, and what do they do, for an entire month? Many, especially city dwellers, have a second home located near the sea, in the mountains or in a small village in the country’s interior. Often these homes have been in the family for generations, and are shared during vacation time by some portion of the extended family. The prospect of vacationing with extended family may seem undesirable at first, but think about it logically: What could be more relaxing for tired parents than to have grandparents on hand to baby-sit during a four week stretch? And they baby-sit for free. This vacation model, however, is starting to change a bit. More young Spaniards – and in particular, those without children – now devote at least part of their vacation to travelling to other countries. And more are choosing to split-up their vacation weeks so that, for example, they can lounge on the beach for two weeks in August and then ski for two weeks in January. This may not yet be the norm, but the practice is growing. We, by the way, never take vacation in August. Why should we? We’d miss all the peace and quiet. Our work phones are silent, email inboxes are empty, and there are no lines at the supermarket. It’s as if we’ve actually gained an extra month of vacation. Plus, there’s a certain perverse satisfaction in knowing that – at the end of August – we still have our full vacation to look forward to while most of our countrymen are returning to work in a fog of depression; albeit a well-rested depression. But staying home and working through the month of August has a downside, as well. Just try to find a restaurant, bread store, tobacco store, or even a pharmacy that is open for business. Granted, the Spanish government mandates that at least one outlet for essential services – and yes, tobacco stores are deemed to provide an essential service – must remain open within a X kilometre radius during August, but having to drive 5 kilometres to buy a newspaper can be a bit bothersome. If I wanted to do that, I would have stayed in the US. Some people – particularly Americans – might ultimately view the Spanish practice of taking a full August vacation as a quaint holdover from a simpler time, but one that has no place in modern society. I disagree. In fact, I can think of at least one high-ranking American executive who has not been afraid to spend the entire month of August on holiday: George W. Bush. He spent all of August 2001 vacationing at his ranch...remember? Then again, that was at a time when he liked Spain. Sal, don`t be wrong: Mr Bush was not on vacation on August 2001, he was working hard, reading and writing a lot designing the Strategy to properly fight "The Evil Axis" (Trade Mark)with the success that the World around could lately admire. No he wasn't. He spent the month watching Green Acres reruns on Nick at Night. Would Anonymous like to clarify whether he was being ironic or literal? If ironic, then okay---duh! If literal, then a-a-a-r-g-h! No wonder the rest of the world think all Americans must be pompous, self-righteous and narrow-minded, even a lot of Americans are not. Either way, I feel sorry for intelligent Americans who have to put up with the likes of GWB as their representative image to the rest of the world. Perhaps they have to be like the Russians and generally not mind if the world thinks their leader is a coldly calculating thug rather than a leader of an advanced and covilised country. By the way, some of my friends in Spain point out to me that George WB walks with the palms of his hands facing backwards rather than inwards. Do you think this is a sign of evolutionary retardation?